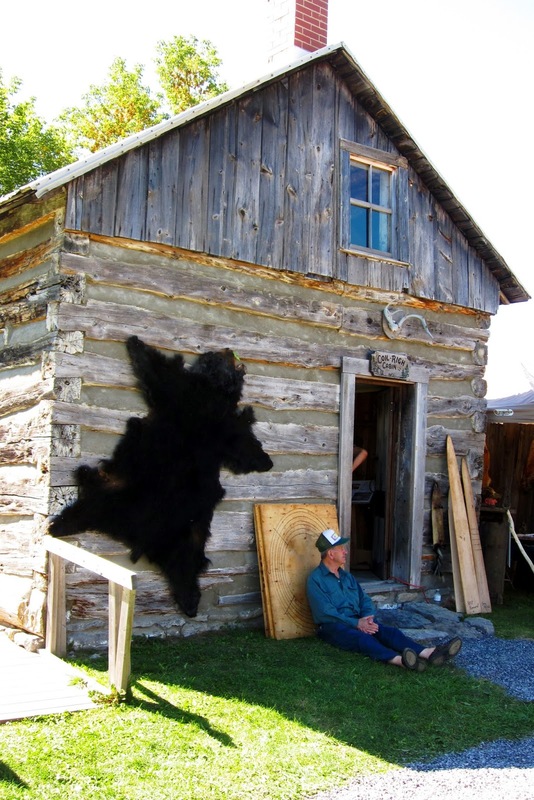 The annual Glengarry Wood Fair at the Dunvegan Pioneer Museum is a great place for anyone who loves all things wood. The center of the Wood Fair is devoted to an auction of lots of beautiful wood. There were hundreds of people who attended the auction and bid on the wood. I guess most of the people were crafts persons. The wood was piled in lots and there was all different kinds - cherry, walnut, oak, beech and so on. I was told these were burls. Some of them were strange shapes. There were also demonstrations. I enjoyed watching this man using a portable sawmill to trim and plane and make boards out of a large log. The smell of the freshly cut wood was marvelous. These pieces of wood were amazing because they were so wide - over 3 ft. across. They must have come from a monstrous tree. Can you imagine having a floor with boards that were 3 or 4 feet wide? ...and these great bird houses. Some of them were very imaginative. When I saw this guy, I felt like I had stepped back in time. There he was, sitting on the grass having a rest in front of a wooden house with a bear skin stretched on the wall. 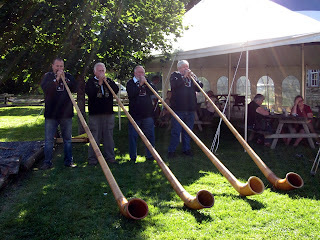 As I left the Wood Fair, these men gave a final concert on long wooden horns. Lovely! It pleases me that such a traditional, organic substance evokes so much in us still, and that it is used for so many things! This event is truly A celebration of the beauty of wood! We should all realize how precious are the trees! I fear that they are disappearing to the clear cutters in Eastern Ontario.